Thackeray Review - Checkout the movie reviews of Thackery starring Nawazuddin Siddiqui, Amrita Rao, Rajesh Khera. The movie is directed by Abhijit Panse and it released in India on 25th January 2019. What should be considered as the most inspiring rags-to-riches story, Thackeray starts with showing an ordinary man Bal Keshav Thackeray (here Nawazuddin Siddiqui) who's a cartoonist. As every inspiring story, in Thackeray, too, his talent was misunderstood by many. Resigning from his job at Free Press Journal, Balasaheb starts Marmik - a weekly portraying his brave cartoons. Blame the Free Press Journal for the rise and rise of Bal Thackeray. At least Abhijit Panse's biographical film holds the newspaper responsible as the trigger for his political career. The news room, dominated by "South Indians", where Thackeray was one of the only two Marathi employees, where he was treated like a worker rather than an artiste, where his cartoons didn't like the owners, eventually forcing him to resign, also appears to have stoked his predisposition towards "apna aadmi (our people)" i.e. Marathi manoos. After trying out their hands in biopics of various actors and sports personalities, Bollywood is currently awash with all things political. From 'The Accidental Prime Minister' based on a book by the same name on former PM Manmohan Singh to 'Thackeray', filmmakers are in a race to outdo each other to rustle up a political biopic. Also in the pipeline are two ambitious projects on PM Narendra Modi and one on the 'mysterious' death of former PM Lal Bahadur Shastri in Tashkent. Like its protagonist, this film is also a rock star. Director Abhijit Panse, who had earlier directed the Marathi film 'Rege' (2014), keeps the narrative simple in this Bal 'Tiger' Thackeray biopic. Panse treats his protagonist like Don Corleone, The Godfather. From the '60s until his death on November 17, 2012, this is the man everyone in Mumbai sought. You knew if you had Thackeray's blessings, you could move freely in Maharashtra. Such was his power, charisma and reach. There are two types of people who know Bal Keshav Thackeray: Those who call him Bal Thackeray and the others who call him Balasaheb, or simply Saheb.The former would never make a movie on him. Nor would they like a movie made on Thackeray's life and politics.The latter would love a Thackeray biopic. And if they made one, it was bound to be hagiographic. When the incendiary trailer for Abhijit Panse's Thackeray landed, the actor Siddharth tweeted: "Nawazuddin has repeated 'Uthao lungi bajao pungi' (lift the lungi and *'#$ him) in the film #Thackeray. Clearly, hate speech against South Indians... In a film glorifying the person who said it! Are you planning to make money out of this propaganda? Stop selling hate! Scary stuff!" With due respect to Siddharth, that is perhaps the point. Thackeray is a warts-and-none propaganda film about a man who peddled hate and keenly fostered a sense of otherness (first South Indians, then Muslims). With the Shiv Sena at loggerheads with its long-time ally, the Bharatiya Janata Party, ahead of the Lok Sabha elections this year, the former must make a splash. What better way for Shiv Sena to reach the masses with its manifesto than make a commercial film, Thackeray, with a Bollywood star in the lead role? Thackeray is a worshipful home video in the guise of a full-length feature film, in which everything is seen solely through the eyes of the man who started life as a testy, outspoken cartoonist, and who, overcome by the 'unfairness' of 'Marathi manoos' having to deal with migrants in their home-state Maharashtra, went on to form the Shiv Sena, a political party whose 'reactions against actions' helped changed the face of nation. For a critic, this film is a massive challenge. It requires separating the lead actor from the rabble-rousing politician he portrays on screen. The performance is stupendous, not the least because Nawazuddin Siddiqui refrains from slavish imitation of Bal Keshav Thackeray. But the worldview of the leader whose biopic this is chillingly disturbing. So as you watch an outstanding screen performer get into the skin of the Shiv Sena founder, you cannot but squirm at the words and ideas that he spouts. A polarising leader is a strong subject for a film, regardless of the line it takes. In the case of Thackeray - written and directed by MNS leader Abhijit Panse, produced by Shiv Sena MP Sanjay Raut, editor of the party's periodical 'Saamna' - there was never doubt about its allegiance. I expected a film back-pedalling the extremism and justifying the late Balasaheb Thackeray's actions. I expected scenes depicting the politician as a warm and misunderstood figure, and a film that essentially turns him into a hero. This is not that film. The occasional self-doubt that Nawazuddin Siddiqui displayed in the biopic of Saadat Hasan Manto is completely absent in his second biopic in four months. 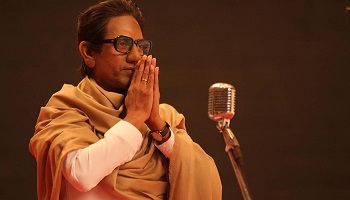 In Thackeray, a film based on the life and theories of Shiv Sena founder Bal Keshav Thackeray, popularly known as Balasaheb, Nawazuddin has attempted playing a controversial political figure with a big heart and total zeal. THACKERAY is the story of the Shiv Sena founder Balasaheb Thackeray. Bal Keshav Thackeray (Nawazuddin Siddiqui) is the eldest son of social reformer Prabodhankar Thackeray and is married to Meenatai (Amrita Rao). The story begins in late 50s when Bal is working in Free Press Journal as a cartoonist in Mumbai. He feels stifled with the restrictions put on him by superiors over attacking certain political figures. Hence, Bal resigns and starts his own political weekly called Marmik. Some of the jokes in Abhijit Panse's Bal Thackeray biopic write themselves. In one scene, furious that cinemas in Mumbai are not screening Marathi films but instead privileging "cheap" Hindi productions, members of the Shiv Sena party get to work. They ensure that Dev Anand-starrer Tere Mere Sapne is replaced by Dada Kondke's Songadya. Of course, Kondke's sexual innuendo-charged films wouldn't meet the moralistic standard that the Sena otherwise advocate.